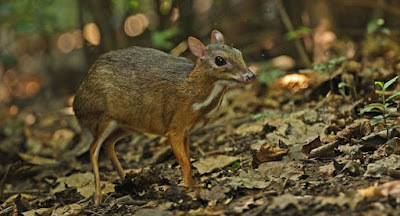 The Mouse deer is diminutive and is no bigger than a fat house cat. Although It is called a deer, it is not a true deer and is classified in a family of its own - Tragulidae. This family of mammals has been around for over 30 million years and has remained almost unchanged. It has avoided extinction by having an amazing reproductive ability-the female can conceive within two hours of giving birth and fawns can stand on its feet within 30 minutes! Smallest of all hooved animals, the mouse deer is only about a foot tall and has a distinctive arch in its back. Their legs are very slender and end in small feet. It does not have any antlers but possess enlarged upper canines. It is a nocturnal and solitary animal although recent studies have shown that they may be diurnal (active in the day) and do form monogamous pairs. They live in primary and secondary forests, usually close to a water source or in hollow trees. They are very timid, and when frightened they will beat their hooves on the ground as fast as seven times per second, creating a drum roll.